There's no room more important in the Amish family home than the kitchen. With big families and busy broods, our woodworkers know better than anyone the value and the happiness that lies in enjoying meals with the family. 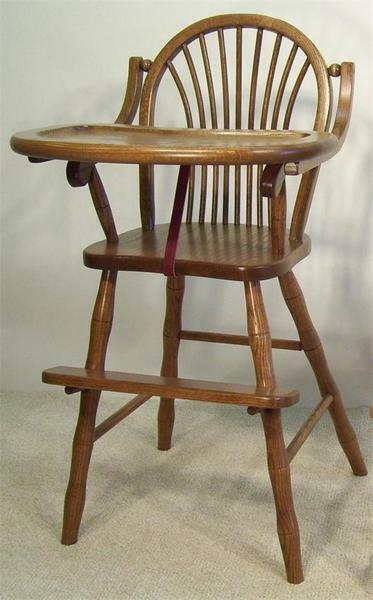 That's why this Sheaf Wooden High Chair - handcrafted in Indiana from your choice of solid wood - is designed to bring the maximum in safety, comfort, beauty and enjoyment to mealtimes with the family's smallest members. The tray in front is stable and smooth, making it a breeze to get the chair's hungry resident seated and comfortable when it's time for dinner or a snack. The chair's smooth, hand-finished surface will stay beautiful through years and years of spilled peas and easy clean-ups, while its complete solid wood construction promises that it will remain strong, secure, and delightful for as many generations as the family needs it to. Its Sheaf-style design - seen in the beautiful details in the chair's back and sides, as well as the incredible lathing work along its legs - give it the look and feel that it needs to be a truly timeless part of any kitchen or dining area. Create your ideal Sheaf wooden high chair using the menus above. If you've any questions at all, please don't hesitate to get in touch with one of our furniture experts by phone or by email - we would love to hear from you. All high chairs ship to any location in the continental United States for a flat rate of $50. Seat Width (Top of Arms): 14 1/4"